Burton upon Trent Municipal Borough was formed in 1878 and was comprised of Burton, Burton Extra (Bond End), Horninglow, Stapenhill and Winshill though each retained their existing civil parish. A coat-of-arms was sought to commemorate the new Borough. The new Burton upon Trent County Borough was granted a coat of arms by Norroy, King of Arms at the College of Arms after its incorporation in 1878 depicted the spread eagle from the Paget family arms, fleur-de-lys from those of the Bass family. The two wavy blue lines represent the rivers Trent and Dove, which meet near Burton. The motto ‘Honor Alit Artes’ is a quotation by Roman Statesman, Cicero, meaning ‘Honour Sustains the Arts’. In 1879 the first Mayor of Burton County Borough, W.H. Worthington, was presented with a Mayoral Chain and Badge of Office which proudly incorporated the new Borough’s Civic Arms. An impressive stonemasonary Coat-of-Arms was also commissioned for incorporation into the newly proposed Market Hall which was opened in 1883. 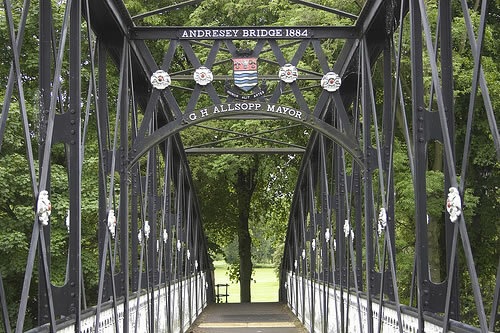 The following year, in 1884, the Burton Arms were incorporated into the Andresey Bridge built by local Engineers, Thornewill & Warham but, for some reason, not featured on the Ferry Bridge built by the same company five years later. County Boroughs were introduced in the United Kingdom in 1889 to allow a borough or city to manage itself independently of County Council control. Burton upon Trent borough, which still came under Staffordshire County Council, became a County Borough in 1901 when it met the criteria of having an area population of 50,000. The Coat-of-Arms was retained. The Arms also became the official ‘Seal’ and featured on all official correspondence as in this very elaborate(?!) letterhead dating from 1903. 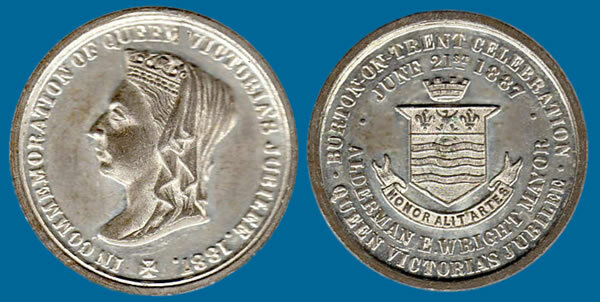 In 1887, a medallion was issued in Burton bearing the civic arms to commemorate the jubilee of Queen Victoria. A number of clubs and societies formed in Burton incorporated the Civic Arms into their own ‘unofficial’ arms. An example was the Burton Leander Rowing club with a badge that remains unchanged over a hundred years later, quite happy to stick with the link back to the days of Burton being a County Borough to make the point of how long established it is. Neither is it difficult to spot the influence on the new unofficial arms of the Burton Golf Club, situated on Ashby Road, with its timely inauguration in 1894. 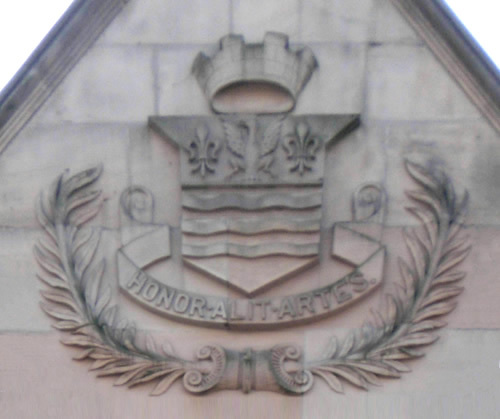 The Civic Arms were incorporated into many of Burton’s most significant buildings in the form of stone masonary. A separate page shows several of these examples, all of which are still in evidence. They are very much taken for granted and overlooked and you will almost certainly have walked past this example on many occassions without even noticing… but hopefully, you will now look for them with new interest! 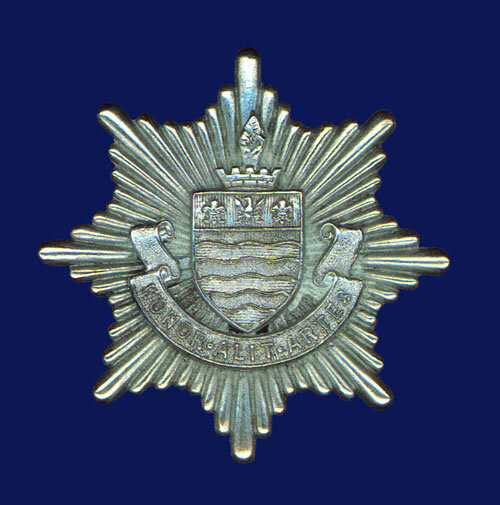 The Borough Arms also featured on much of the regalia of organisations that fell under the Borough Council’s control such as this official badge of the Burton Fire Brigade. In 1903 the Town found itself in major disruption as tram tracks were and cables were constructed for the new public tramway system to handle a fleet of 24 double-decker trams. Thus, Burton Corporation Transport came into being to run them. To continue the trait, a new emblem was created, incorporating the Civic Arms. It can be seen below in a corporation badge and was also featured on the actual tram cars livery. In 1910, proceeds from an aviation display which took place on Bass’ Meadows and organised by the Council’s Entertainments Committee, were used to purchase a chain and badge for the Mayoress at the time, Mrs Mary Jenkins. Her initials are incorporated in the chain. 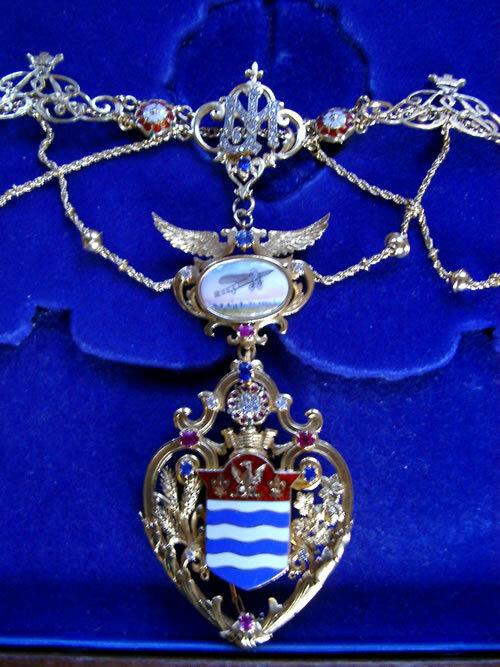 Besides a large badge featuring the Borough’s Arms, there is an enamel medallion depicting an aeroplane. In 1928 the County Borough added as a Crest to the Arms which included a hand holding the saltire of Saint Andrew as an allusion to the early medieval chapel on Andresey island founded by Saint Modwen. The revised design was submitted to the College of Arms for approval and registration. 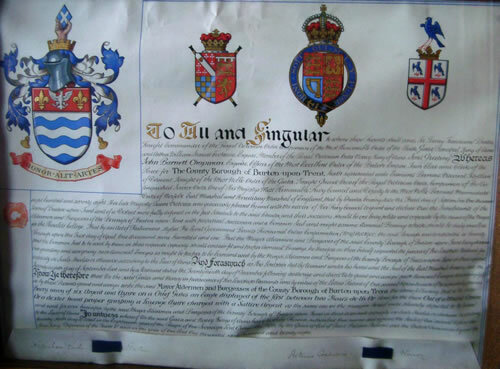 This resulted in what was to be the final update to the ‘Grant of Arms’ which hangs which still hangs in the Council Chamber in Burton Town Hall. TO ALL AND SINGULAR to whom these Presents shall come, Sir Henry Farnham Burke Knight Commander of the Royal Victorian Order Companion of the Most Honourable Order of the Bath Garter Principal King of Arms and Arthur William Stuart Cochrane Esquire, Member of the Royal Victorian Order Norroy King of Arms, Send Greeting: Whereas John Barnett Chapman Esquire, Officer of the Most Excellent Order of the British Empire, Town Clerk and Clerk of the Peace for The County Borough of Burton-upon-Trent, hath represented unto Edmund Bernard, Viscount FitzAlan of Derwent, Knight of the Most Noble Order of the Garter, Knight Grand Cross of the Royal Victorian Order, Companion of the Distinguished Service Order One of His Majesty’s Most Honourable Privy Council and Deputy to the Most Noble Bernard Marmaduke Duke of Norfolk, Earl Marshal and Hereditary Marshal of England, that by Charter bearing date the Third day of September One thousand eight hundred and seventy eight, Her late Majesty Queen Victoria was graciously pleased by and with the advice of Her Privy Council to grant and declare that the Inhabitants of the Town of Burton-upon-Trent and a District more fully defined in the first Schedule to the said Charter, and their successors should be one body politic and corporate by the name of the Mayor Aldermen and Burgesses of the Borough of Burton-upon-Trent, with perpetual succession and a Common Seal and might assume Armorial Bearings which should be duly enrolled in the Heralds’ College: That by an Act of Parliament, styled The Local Government Boards Provisional Orders Confirmation (No9) Act 1900, the said Borough was constituted a County Borough upon the First day of April One thousand nine hundred and one: That the Mayor Aldermen and Burgesses of the said County Borough of Burton-upon-Trent being desirous that the Common Seal to be used by them in their corporate capacity should contain fit and proper Armorial Bearings, he therefore on their behalf requested the favour of His Lordship’s Warrant for Our granting and assigning such Armorial Ensigns as might be proper to be born and used by the Mayor, Aldermen and Burgesses of the County Borough of Burton-upon-Trent in their corporate capacity on Seals Shields or otherwise, according to the Laws of Arms: And forasmuch as His Lordship did by Warrant under his hand and the Seal of the Earl Marshal bearing date the Twenty eighth day of September last and by a Warrant dated the Twenty ninth day of December following authorize and direct Us to grant and assign such Armorial Ensigns accordingly: Know Ye Therefore that We the said Garter and Norroy in pursuance of His Lordship’s Warrants and by virtue of the Letters Patent of Our several Offices to each of Us respectively granted do by these Presents grant and assign unto the said Mayor Aldermen and Burgesses of the County Borough of Burton-upon-Trent the Arms following that is to say:-Barry wavy of six Argent and Azure on a Chief Gules an Eagle displayed of the first between two Fleurs-de-lis Or And for the Crest Out of a Mural Crown Or a dexter hand proper grasping a Lozenge Azure charged with a Saltire Argent as the same are in the margin hereof more plainly depicted to be borne and used forever hereafter by the said Mayor Aldermen and Burgesses of the County Borough of Burton-upon-Trent in their corporate capacity on Seals Shields or otherwise accordingly to the Laws of Arms: In witness whereof We the said Garter and Norroy Kings of Arms have to these Presents subscribed Our names and affixed the Seals of Our several Offices this twenty sixth day of April in the Eighteenth year of the Reign of Our Sovereign Lord George the Fifth, by the Grace of God of Great Britain Ireland and the British Dominions beyond the Seas. King, Defender of the Faith & c and in the year of Our Lord One thousand nine hundred and twenty eight. The final approved and registered design, as featued on the new ‘Grant of Arms’ can be seen below and was to become the official Burton County Borough Coat-of-Arms until eventually being absorbed by East Staffordshire Distric Council. 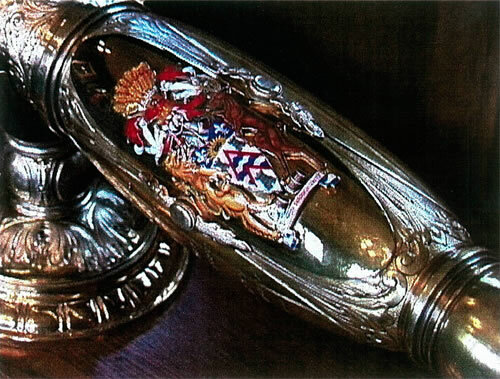 A Mace was donated to the Borough in 1935 by the first woman Mayor, Mary Goodger, to mark the silver jubilee of George V. It has an enamel medallion with the Borough’s Arms. In 1992, a medallion featuring the Arms of East Staffordshire Borough Council was added. This Mace replaced a much older one which was re-discovered when the old Town Hall which stood in the Market Place was demolished in 1770. The Mace was lost/stolen in 1848 before Burton was awarded County Borough status. Mace Bearers originate from the times when a mace was a formidable weapon. Bearers were effectively there to offer protection so were in fact, an early form of bodyguard and usually a member of the guard corps. Their modern day counterparts are not usually particularly fearsome! Following the Anglo-Saxon tradition, there is usually a single post of mace-bearer per mace. Nowadays, it is of course purely ceremonial and the duty of the mace-bearer is to carry the mayor’s great mace in front of him when performing official business. 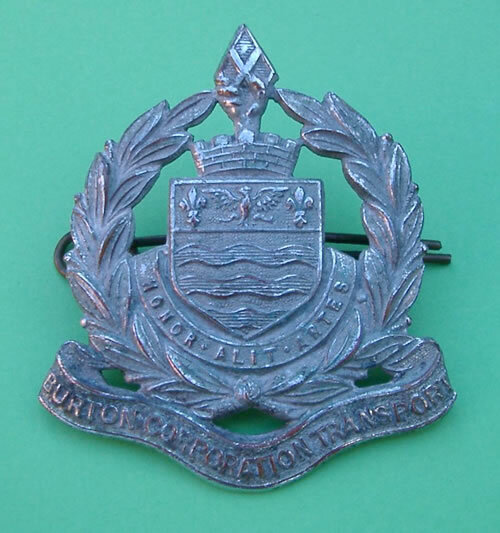 A chain and badge for the Deputy Mayor of Burton Borough was given by the town’s Freemasons in 1955. It can be seen below as supplied in its equally attractive display box. Note that it now incorporates the revised Coat-of-Arms. In 1973 the Civic Arms were replaced as Burton Borough was absorbed into the new East Staffordshire District Council.